The 225-HMP155A Relative Humidity & Temperature Sensor has a new generation HUMICAP®180R sensor that has excellent stability and withstands well harsh environments. 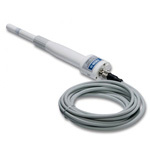 With its fast response time, the temperature probe for the HMP155 is ideal for measurement in environments with changing temperatures. The 225-HMP155A Relative Humidity & Temperature Sensor has a new generation HUMICAP®180R sensor that has excellent stability and withstands well harsh environments. The probe structure is solid and the sensor is protected by default with a sintered teflon filter, which gives maximum protection against liquid water, dust, and dirt. 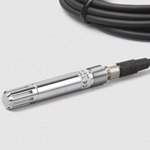 With its fast response time, the temperature probe for the HMP155 is ideal for measurement in environments with changing temperatures. 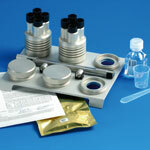 The new membrane filter speeds up RH measurement. 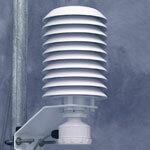 Protecting the sensor from scattered and direct solar radiation, as well as precipitation, will increase its lifetime. Thus, NovaLynx recommends installing the HMP155 in a solar radiation shield or instrument shelter. The 225-500-B Relative Humidity & Temperature Sensor has the addition of an integrated circuit transducer that provides a linear microamp current output proportional to temperature. The 225-501-B utilizes a one-element thermistor for temperature measurement.